What do you look for in a neighborhood? Great schools and easy access to major employers? Shopping, dining, and entertainment options to please the entire family? Recreational opportunities and the great outdoors? When going down your neighborhood checklist, we’re confident you’ll find exactly what you’re looking for in Tuscany Village’s Ontario neighborhood. We’re near many of your favorite places, or at least they will be after you move into the area. When it comes to your everyday life and how you spend your time, you’ll appreciate the convenience of living in Ontario. We’re close to major employers such as the QVC Warehouse, Target, Ontario Convention Center, Citizen's Business Bank Arena, and the Ontario International Airport. For families with children, they can attend Mariposa Elementary School and Ray Wiltsey Middle School, which are down the street, and Colony High School. Catch the latest blockbuster at AMC Ontario Mills 30, a large multiplex located in the Ontario Mills Mall. While you’re there, pick up a pair of new shoes at the Vans Outlet, dine at the Rainforest Cafe, and get the newest video game your child has been asking for at Game Stop. When it comes to shopping in Ontario, you won’t be disappointed in the selection of stores and merchandise. With easy freeway access and a short commute to the LA/Ontario International Airport, getting around town and the country has never been easier. Whether you travel for work or pleasure or are employed at the airport, you’ll appreciate the convenience of being nearby. 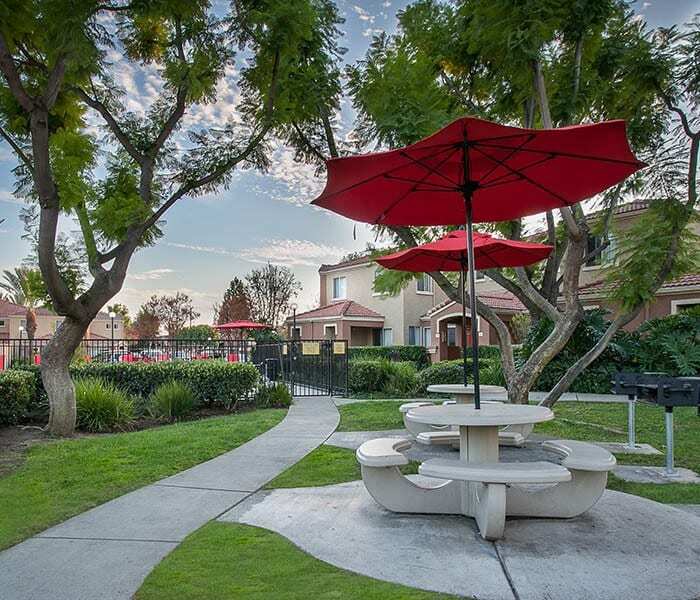 We’d love to tell you more about the neighborhood surrounding our Ontario apartments near Raging Waters. Browse our selection of floor plans and then contact us to schedule your personal tour. Get to know the neighborhood while you’re here and we’re confident we’ll be seeing you around the Tuscany Village Apartments community soon.